Welcome, my friends. It is a Friday. Don’t we love Fridays? 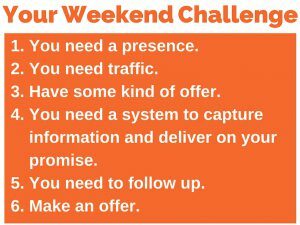 We do here at Marketing for Owners, because we have the weekend challenge. If you want to see ones we have done before, simply visit marketingforowners.com/challenge, there are a lot of them for you to complete. Go on, go knock yourself out, but not until you have listened to this because we are talking about lead generation. And in a perfect world, you have the leads coming in all the time because leads are then converted to sales which means customers and then you convert them into repeat customers and then you convert them into regular customers. And then it cycles and it just goes around and around because those regular customers also recommend their friends. 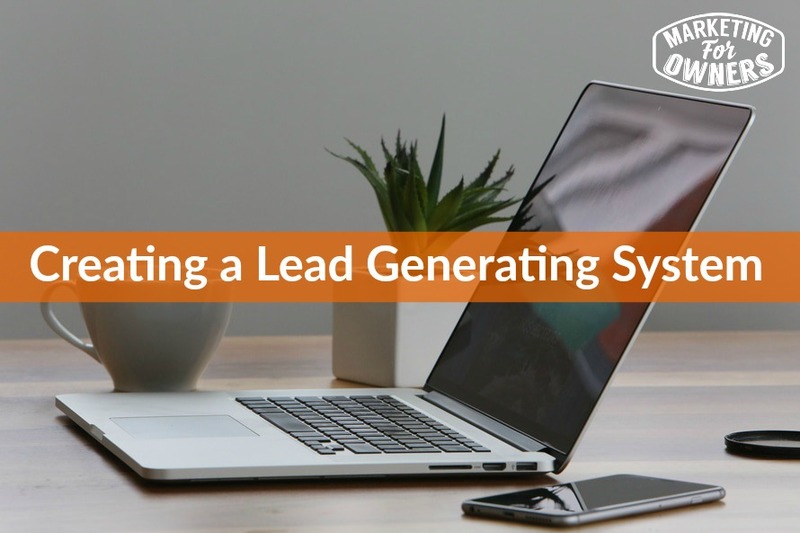 But it all starts with generating leads. Now a lot of people want to generate sales, but quite often, in fact, more often than not, you need to generate a lead, someone who could be interested, is interested and needs to learn more. So, where do we start? That can be off-line or it can be online. Obviously the easiest way is to do this online, a presence is your website. Please do not send someone in a lead generation method to a social media page, please do not build a web, an online business or anything based on a social media page. Build it on your own website, one that you host via a hosting company that is not free and that you update all the time. Now off-line, quite simply you need a presence, you need a business, you need to be something; you need an address and a phone number and things like that so you can still generate leads off-line. The next one, number two is you need traffic. And by traffic we mean footsteps, finger clicks, people; people need to visit your website and to see what you’ve got for them. Or, people need to view your direct mail offering, your advert, whatever it is. So you need to be able to identify your ideal customer and you need to place an advert or something in front of them in the place where they hang out. Now this could be Facebook marketing, it could be direct mail to their home address, to their business address, it could be an advert in a trade magazine, it could be an insert in a local business chamber of commerce or business publication or magazine or something like that, that dropped out when they opened it up. Now this is the part where it asks them for, your advert or whatever, asks them to give permission to give their e-mail address or their address or their phone number and their details and their contact details in exchange for what you offer. Now you are going to give something for free, something of amazing value, something that you could sell to them if you so wanted. However, you’re going to exchange it for the lead because that is better value. Online it’s generally known as a lead magnet; which means it creates an irresistible magnet for your leads to come to you. And it could be an e-book, it could be a course. One of mine for example is, our freemarketingcourse.co, it’s fabulous, it’s a twelve day course on entire marketing system, for free. It’s a series of little short videos delivered to you every single day; the kind of thing that a few years ago you would have had to pay $297 or more for and now we give it away for free. But there’s e-books, there is daily reports, there is checklists, there is resource lists, the top five this, the top five that. For a photographer, these are my top five tools that I use in my business every day, you may want to use them too. That kind of thing, irresistible, magnetic. So in other words, you need, in the online world, you need an e-mail service provider. Common ones are Mail Chimp, AWeber, Convert Kit, InfusionSoft, and organizations like this. What happens is they are connected with your lead magnets so when someone enters their name and e-mail, it automatically connects there. So in other words, these are just copy and paste bits of code, you don’t have to be anything technical. Or you can use Lead Pages, Click Funnels, things like that. And it connects to an e-mail service provider’s, database, puts all the details in, when they signed up, where they signed up, what offer they signed up to. And then, if you set it up right, it will deliver the lead magnet, the first e-mail to say thank you, here is the e-book you requested, here is the download link. Or, here is a day one of our course, here is the checklist. This is how to get. If you are doing this off-line, of course, you get this in, you probably got it in via a reply paid free post postcard or an offer with a toll-free or 0- 800 number, or 1-800 number free phone, something like that with some kind of offer, so as to make people take action to claim their prize. They have to be able to give it to them because it deals with number 5. Now please, I’m going to say this a few times, follow-up, follow-up, follow-up! Tomorrow, I am going to a local business fair, whatever you call these things, a local event where am going to meet people and and then also get some new ideas. I can guarantee, absolutely guarantee I could put money on it, of all the people I ask to contact me because I read actually want them to contact me, roughly half will do so. And of the ones that do, some will just contact me once. And that will be it, they will just give it to someone back in the office and say hey, say thanks to all of these people and tell them we will be in touch. That’s the last I will ever hear. Now will I follow them up and will I call them? No. Why should I make effort to be sold to? If that’s the kind of attention you’re going to give, you’re not getting my business, I want customer service, I want a good company, I want modern. I’m not going to make an effort for you. So please follow up. So once you’ve got that lead, once you’ve delivered what they want, follow-up afterwards, there was a reason for getting the lead. So many people online talk about list building and lead magnets and getting them in, you know sign up with AWeber, get them on the list. And then what? You don’t do anything, you don’t send them any e-mails, you don’t contact them again. You must have a system, so why now, a couple of days later, e-mail them again and ask them if they got what you had. Why not phone them up, the people that contacted you off-line and check that it arrived? Whatever it is they were expecting. And then a few days later contact them again and ask them what did they think and etc., etc. You tell them what else you have for sale. But honestly, please, please follow up, don’t just abandon us. Up to that point, you have sort of hinted at what else you do, they can look you up if they are really interested and it should be kind of obvious what you do. But then eventually, make them an offer. Say for example in my business, in the Marketing for Owners, you can go to marketingforowners.com/free time, you can book a half hour free, what you call it, consultation or free talk with me, which is pretty good by the way. This would cost good money but it’s amazing what I can give you in that amount of time. And it’s not a sales call, but that is part of the offer. 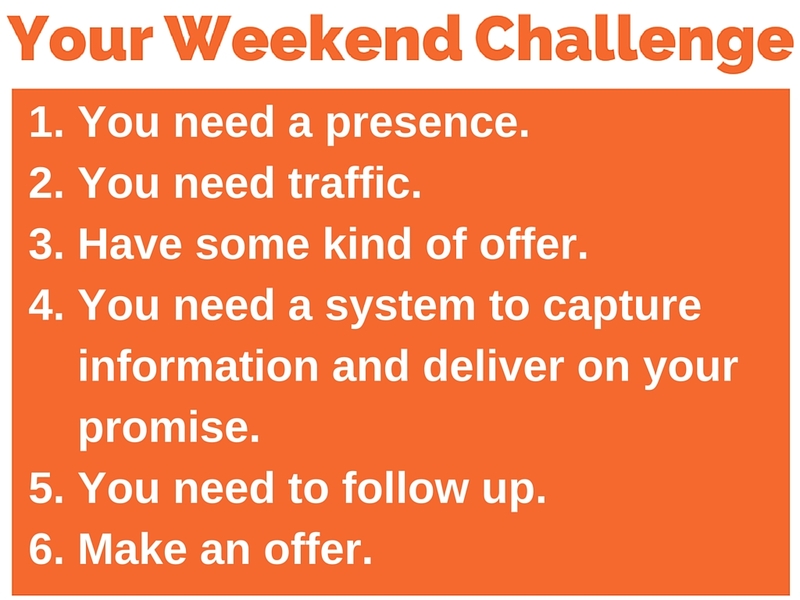 Make an offer and that’s all there is, that’s a lead generation system starts when, that’s it. You can pad it out but that’s the basics. So go back, set that up over and over and over and over until you find an offer that works and you perfect it. You won’t hit it out of the park the first time, but this will work, this is how businesses do it. Go for it. And have yourself a wonderful weekend. You know what? I’ll be back on Monday.